Dear customers! We will not work from 29th of April till 03th of May. All orders, placed at this time, we will proceed at 6th of May. Anti-Aging Serum Maroma is a highly effective formula based on natural, environmentally friendly oils. This serum nourishes, rejuvenates the skin, smooths wrinkles, reduces pigmentation spots and smooths the skin color. Also Anti-Aging Serum Maroma reduces the harmful effects on the skin of the ultraviolet. - Avocado oil moisturizes and softens the skin, has anti-inflammatory properties, treats acne. - Apricot oil is rich in Group B vitamins, vitamin A and C, moisturizes, heals damaged skin, reduces wrinkles and maintains skin elasticity. - Nut rich in vitamin E, has a rejuvenating property, moisturizes the skin, protects against ultraviolet rays, treats acne. - Shea butter nourishes, moisturizes, has anti-inflammatory properties, smoothes the skin. - Peptide sweet Lupine prevents skin damage from ultraviolet rays, moisturizes, improves skin regeneration, reduces wrinkles. 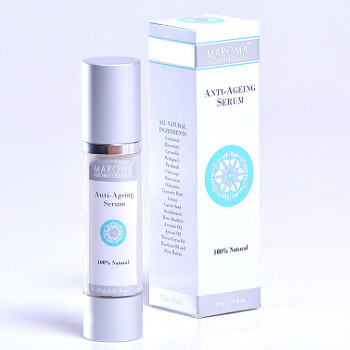 Anti-Aging Serum Maroma is suitable for all skin types and can be used as a day / night cream. Content: Geranium Oil, Rosemary Oil, Lavandin Oil, Lavender Oil, Petitgrain Oil, Patchouli Oil, Clarysage Oil, Ravensara Oil, Olibanum Oil, Turmeric Root Oil, Lemon Oil, Carrot seed Oil, Sandalwood Oil, Rose Absolute, Avocado Oil, Apricot Oil, Wheat Germ Oil, Hazelnut Oil, Shea Butter, Ethylhexyl Olivate, Tocoferol acetate (Vitamine E acetate), Vegetal Glycerine, Glyceryl Stearate, Dehydroacetic acid, Benzyl Alcohol, Ecosert sertified Hydrolysed Lupine Protein, Dipalmytoyl Hydroxyproproline. Application: Apply a small amount on the face and neck with light massage movements. Anti-Aging Serum Maroma is completely natural and does not contain synthetic flavors, dyes and preservatives.